We believe that Places can be remade to center our most at-risk community members to improve health, wealth, quality of life and community prosperity for all. To thrive, People need a nurturing, healthy environment. The healthy choice must be the easy choice. 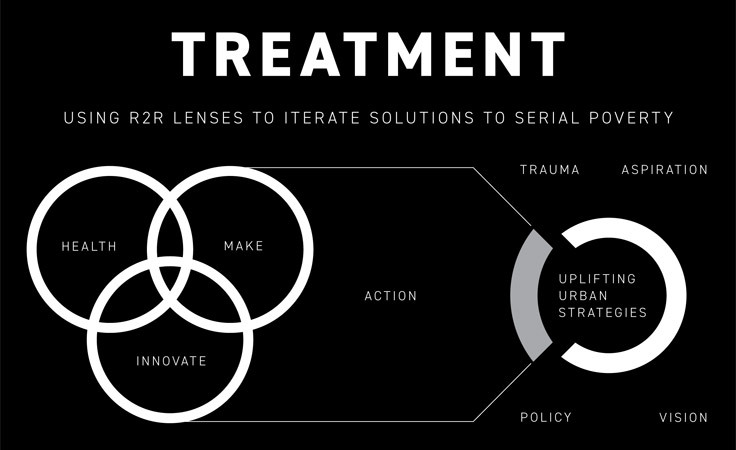 Together, we imagine, make and implement “right-sized” innovative design solutions for pressing social issues. We use data to our advantage! We leverage all assets for social good. When assessing, diagnosing and prioritizing our community’s most acute issues, we look to root causes to inform our “treatment” plan. We make, replicate and test the most innovative, upstream solutions that have the biggest impact in the lives of our marginalized, socially vulnerable people. We know that creating a safety net makes our whole society stronger and more prosperous. We agree that one’s ZIP CODE is more determinative than one’s genetic code for health/wealth outcomes, that nurture is as, if not more, important than nature and that people embody in/equity epigenetically. We understand that SERIAL POVERTY is the problem; that INEQUALITY IS MAKING US SICK. We’ve found that Oregon’s income, employment, education, housing and health data highlight that WOMEN AND CHILDREN ARE MADE VULNERABLE by social, economic, environmental and political disparities. For that reason, we propose a FAMILIES-FIRST APPROACH. Right 2 Root proposes that Community RE/Construction requires us to use placemaking as a health/wealth intervention. Eighty-five thousand Black individuals live in Oregon according to 2015 figures from the U.S. Census Bureau. Oregon’s share of health disparities costs is $6.25 billion per year. 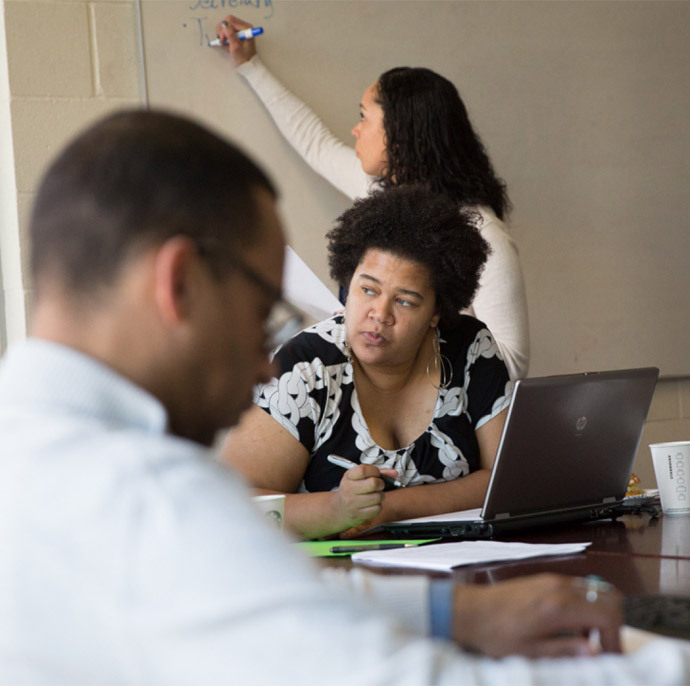 The potential benefit of supportive neighborhood services for the African American community within a public health program is reduced racial disparities and fiscal cost to government and non-government services. Organizing and encouraging community services for the African American community is a major step forward in reducing stress and improving health outcomes within the city, county and State. We use a public health approach to shift our understanding of the root causes of health/ wealth disparity from individual blame to institutional causation, as well as to identify and innovate impactful upstream solutions that hit multiple bottom lines—social, economic, environmental, health and wealth. We heard from the community that the impacts of the social determinants of health, developmental origins of health and disease, and Epigenetics are traumatic, preventable, reversible and avoidable. Prioritize equitable and fair allocation of budgets and resources, and use existing underutilized assets such as land, facilities and urban systems to connect people in Root and Anchor areas to create cohesion and prosperity. Connect dispersed social, economic and cultural resources to lift the most vulnerable from serial poverty. Right 2 Root conducted nearly three years of focus groups, community meetings, 1:1 coaching, small business mentoring, charrettes and design-a-thons with Black community members at-risk and impacted by gentrification. Participants shared their vision of places to express and celebrate cultural roots and heritage, benefit from jobs, education and business opportunities and investments, and have affordable homes in stable, flourishing neighborhoods with access to healthy food, transportation and opportunities to make our lives better. Our Phase I report has conceptual mixed-use site drawings illustrating this vision. To make a society that aligns with our values and understand how to accomplish this feat for one of Oregon’s most underserved and excluded communities, we must look to the causal link between historical policy and current inequity. We must reframe multigenerational discrimination, serial forced displacement, gentrification and institutional racism by their consequence, ill health, rather than their intention, “benign neglect.” Innovation of “right sized” solutions demands that we look to social, economic, political and cultural systems, as well as the built and natural environment, to understand and identify upstream solutions. Healing will require creative and innovative solutions to redress and reverse the effects. We believe people are community assets, underutilization is a waste of human resources and our integration can create a regenerative, circular economy to uplift community. We adhere to a Resilience Imperative, and know that—with committed partnerships—in the right environmental and socioeconomic ecosystems, individuals and communities can heal, thrive and RE/Construct. We know resilient people and communities are more stable, prosperous and productive. Therefore: Our Right 2 Root campaign is driven by an equity imperative. We use a culturally competent, responsive, specific process to facilitate intersectional assessments (race+class+gender) and community engagement to drive interventions and investment. We let the data drive our work to where the need is greatest, and we center the most impacted early and often. Right 2 Root seeds the capacity and cultivates the opportunities that will reverse current inhibitors, create healthy, connected environments, and enable recovery, improvement and resilience. In so doing, our Black community will realize increases in income, education, housing and employment, and start on the path to parity of outcomes. Asset-based community development (ABCD), an approach that catalyzes change and initiates development based on utilizing the existing gifts and capacities of people and their communities. The ABCD model discourages development brought in from an outside source, but rather energizes change and development from within. 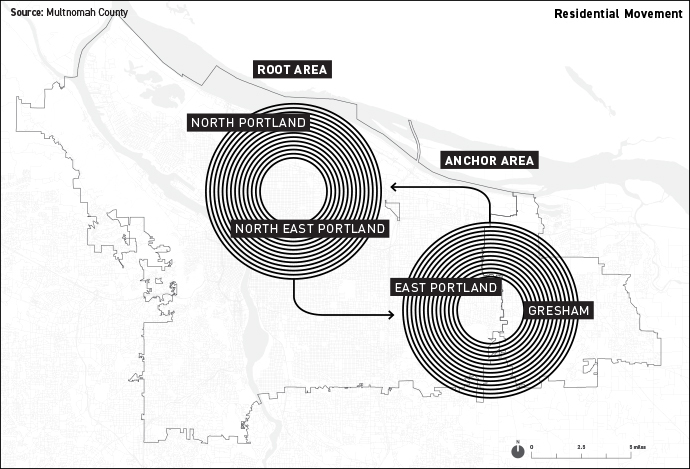 With displacement and movement across Root and Anchor areas, people become more dispersed and disconnected from vital services and each other. Families are uprooted, separated geographically from each other, as well as from cultural and environmental institutions needed for health, living and working. This disconnect hinders community cohesion, causing chronic stress and isolation to community members and families while increasing financial burden. Savings in rent are consequently spent on transportation and travel to culturally specific institutions in the historic heart of the community. Therefore, we are ever mindful that disparities reinforce one another in myriad ways—multiplying cost exponentially as symptoms become acute. 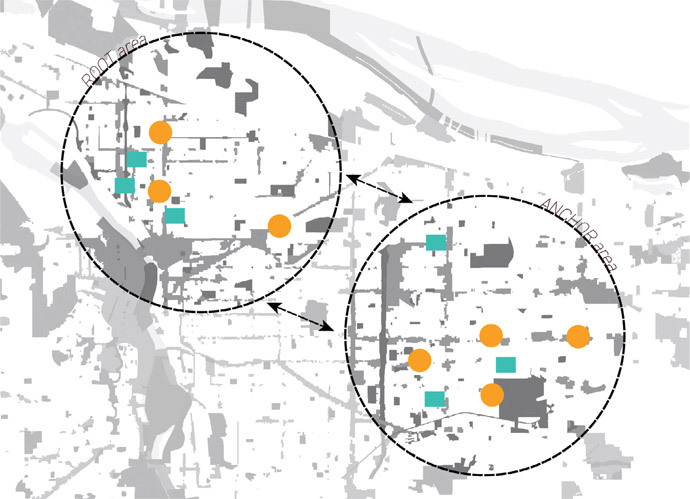 Create mixed-use, culturally specific, multigenerationally supportive institutions, facilities, businesses, services, employment and education in transit-served open space, underutilized land and adaptive reuse sites in Root and Anchor areas. The diasporization of African American community members is separating individuals and families, cultural and social resources throughout a dis-integrated geography. This is adding stress and cost, fomenting impoverishment. When an individual’s income exceeds the local cost of living, they have a distinct economic advantage, mitigating for separation from traditional resources and networks. When an individual’s income is below the cost of living, they have a distinct disadvantage, exacerbated all the further if separated from family, friends, neighbors or other partners who have historically provided support, and now live in other parts of the city. The condition of poverty is exacerbated by the racial income gap between white and Black Oregonians. It has a related health-outcome burden that is most frequently borne out within underserved communities. To close these two gaps, the income and assets, overall, in the African American community need to be raised to parity and the location of assets and resources needs to be fairly distributed across a larger city geography. Part of the needed improvement is to locate opportunities to support community areas in those places where people are Anchored due to displacement. The other is to connect underserved people with opportunity in Root areas. Creating better and more convenient community networks between them is crucial. Culturally significant services in the city’s Root and Anchor areas are needed to support and help people in poverty gain access to housing, income, education and employment. Overcoming inequality requires the coordinated efforts of impoverished families and communities working collaboratively with friends, neighbors and partners from the larger community to make and implement innovations. Using new poverty reduction lenses and other capacitation skills and techniques to direct and harness resources, assets and investment of work, wealth and wisdom, the community can work to organize and modify city form through planning tools. 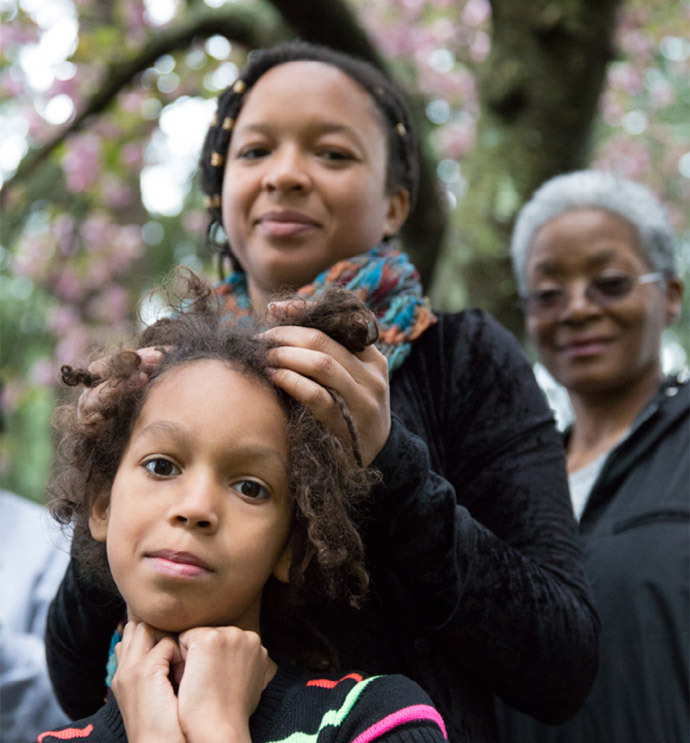 Though this report focuses on challenges facing communities of color in Multnomah County, it is important to also recognize these communities’ many strengths. Communities of color have a wealth of protective factors, as well as histories of strength and resiliency. This goal is achieved when families pay the recommended 30% of monthly income to housing and utility costs. This goal is achieved when un/under employed people have access to meaningful work that pays a living wage. This goal is achieved when high school and post-graduate rates reach or exceed parity, and employment and income rates are commensurate. This goal is achieved when the cost of living is exceeded by income from employment or entrepreneurship and/or dividends from assets. Through the health lens, community cohesion strategies form preventative, harm-reducing and curative measures that ensure social justice. Community and individual resilience relies on a variety of environmental, social and economic relationships. 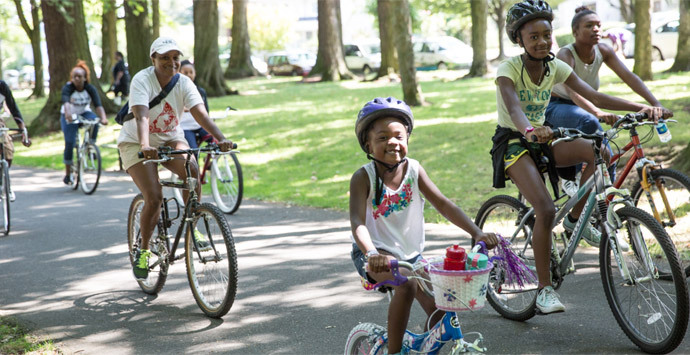 To thrive, community members need permanent access and connection to resources, neighborhoods, opportunities and assets. At the core, successful health outcomes are the product of inclusion, sharing and interconnectedness. Health indicators will signal individual- and population-level resilience and recovery.